The english version of this homepage will no longer be updated. Please see the swedish version instead. It all began one early november day in 1999, during a visit at the Romanian state stud of Mangalia, long time breeder of Pure Arabians. We - Cora and Gabi - decided to go there just to take a look at their beautiful arabians, we probably did not intend to return home with one of our own! That early november morning we arrived at the farm and started walking peacefully around the stables, but the longer we stayed, the more fascinated we became about their horses, and decided to take a look at the younger mares as well, since we've been hanging around the stallion barn the whole afternoon. As we went into the stable where they kept their fillies, there was a brownish-roan mare with black mane in the stall right next to the door, looking back at us... Those eyes could really make anyone melt of pleasure, as they were saying "I will be a good horse, just pick me! ", so we took her out of the stables, with her saddle on. After a few laps lungeing her since she hadn't really been out of the stables for quite a long time, it was time to mount her. Even though she barely knew what the saddle or rider was, she did not have any trouble accepting us on her back. Her eyes was sweeping the surroundings and her ears was turned backwards, giving us her full attention as we walked around the arena in a calm pace. After another few laps trotting we felt there was no point straining her back anymore, and dismounted. We were completely satisfied with the short but giving ride she offered us, and as soon as our feet touched the ground we knew there was no point leaving the studfarm without her. The mare was a little arabian named Gazal XVI-13, and though many say that the number 13 only brings bad luck, she certainly did not agree. We continued our walk around the studfarm, looking at some more horses, but it felt like no other was quite the same, and our thoughts went back over and over again to that tiny little filly with those gorgeous, big, kind eyes, and all of a sudden we just knew that it was just the horse we were looking for. After a little arguing about how fast we could bring her home to our stable, we went to the director of the farm and signed the ownership papers. Two long weeks later we were finally able to bring her home to the stable we've chosen to board her in, right outside Bucharest. Since she was more unhandled than handled, a 3,5 year old arabian mare that had only taken a few spins around the racing track earlier that summer, though with good results, you can imagine that she didn't really want to get into the unfamilliar trailer! But half an hour later she was finally inside, and the road home could begin. Finally home, she got a few days break with long walks through the woods since we didn't have any saddle, bridles or any kind of equipment at that time, also giving her a chance to get used to the surroundings which she did pretty fast. So how did Jazirah become Jazirah? Since we had to share the horse, we actually agreed on one thing. Since Gabi got to choose the horse, Cora got to choose the name. As soon as we put her name tag on the box she was officially our filly, by the name Jazirah (It means Island in Arabic). 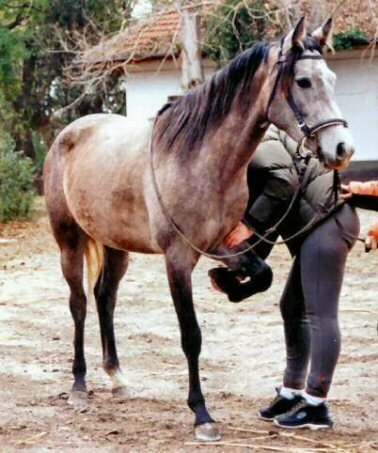 Jazirah's father Gazal XVI was one of the ten chief sires at the Mangalia stud and her mother was a mare sired by Siglavy Bagdady IX, also one of the headsires of Mangalia stud. As her pedigree clearly shows she is a good runner through many generations of different blood strains, all horses are put to the test on the racetrack before accepted as breeding material. Jazirah obtained a total second placing throughout all her qualification races earlier that summer, and believe us, this horse really loves to run, and she is fast! When we bought her we chose her because of the tender and honesty she radiates, along with that enormous spark of life in her eyes. In the beginning we realised that she wasn't really educated at all under the saddle, so we began her training. Many times she showed us who the boss really is by jumping over the 1,35 metres corral fence as soon as she got bored at the exercises we put her through. It was actually very easy to learn this horse new things since she is indeed very, very intelligent and gets the point right away, and sometimes even gets bored if the training is too dull! To better describe her we can say that she is a very brave horse, don't get spooked over nothing, but like any arabian she clearly likes to show herself off and will take any moment of dullness to do that. Jazirah is always very eager to please you, she jumps any fence how scarry it may seem or how big it may be, without ever hesitating. She solves most problems by herself in her keen curiosity and spirit to investigate. Jazirah is very spoiled we can say. Since we have tried to use more unconventional methods we have avoided as much as possible the punishment by force or whip, she corrects herself merely by the voice if needed. The non-violence have instead given her room to make her own decisions, and that has actually helped imensely in many situations. For example when we wanted to trailer-train her it took us about twenty minutes to load her the first time, with the mere help of a bucket of oats, and since that first training she has walked right in the trailer without ever hesitating, since she discovered by herself that it was ok in there. She just walks right in, it doesn't matter if you are loading her at your home stable or at any competition arena. It has now been over three years since we got her, and every day she improves. She actually prefers to learn new things despite the difficulties rather than doing the same exercises over and over again. So to please her willingness to learn, she is being trained classic dressage, showjumping, endurance, eventing and some western moves. When Jazirah is having a good day, she is a dreamhorse to ride, going nice and steady in the dressage, and keen to jump anything up to 1,20 metres, never refusing to jump an obstacle and almost never touching the rails, a horse with good characteristics for three-day-event competitions on the easier levels. In the stable she is really calm, you dont need to tie her up to groom her, she just stands by you wherever you go. We even taught our little niece Sabrina to ride on her! She is kind to any beginner, in the box and on her back. Jazirah is also very kind to all horses, humans and even dogs. No farrier has ever had problems cleaning Jazirah's hooves, although she has never been shoed yet since she has really hard, small, quality hooves. The vet likes her as well, since she likes the vet too and lets him handle her as he desires. Jazirah really is a dreamhorse, and she will never let you get bored in her company. 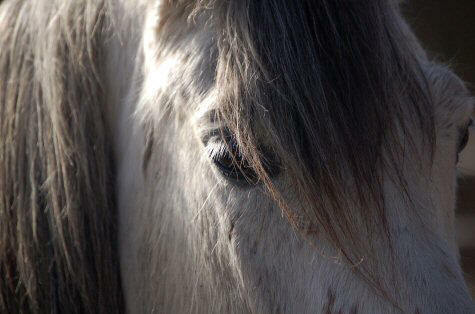 She is our horse, for now, and forever, and no matter how nice you ask she will never be for sale! If you want to take her out for a ride, all you have to do is to ask us, cause Jazirah has a spirit too big for just us two, and therefore we will share her happy spirit with anyone who needs it. Too many things has happened the last years, but here are some worth mentioning anyway, a few of the events and happenings that makes Jazirah what she is now, and forever. May 2000: The first competition Jazirah participated in after she was reformed from the racetrack into a showjumper. An easy showjumping class for debutant horses, ridden by Bobby Negrei. The results were optimistic - a clear round. 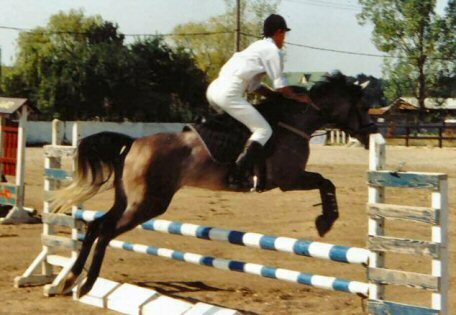 January 2001: Showjumping event at the Equestra Club in Otopeni, ridden by Bobby Negrei in the 90cm amateur class. First day they finished with 8 points penalty, the second day with 0 penalty and a shared 3rd place. May 2001: Participated at the International Student Riding Competition held in Bucharest, carrying riders from 3 different nations around an 90cm obstacle course. Some did well, others did worse. Jazirah did her best anyway. 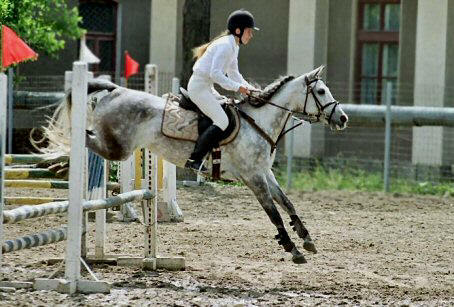 June 2001: First competition away from home, held at the Dinamo Riding Club in Bucharest. All went well, loaded onto the trailer like there was nothing to it. The competition itself went extremely well, finished the class with no penalties and no hesitation, but due to a desorientated rider, Bobby Negrei, they jumped the wrong fence and were eliminated. 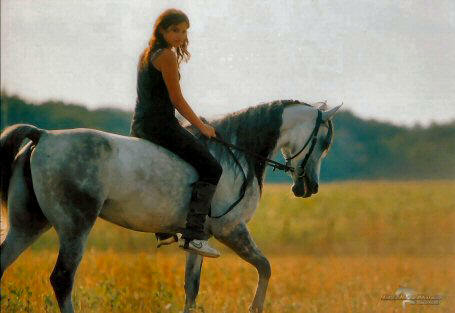 July 2001: Entered in the amateur showjumping class at the Bucharest Cup held at Hipocan Corbeanca, ridden by Gabi. A clear round was the result this time. 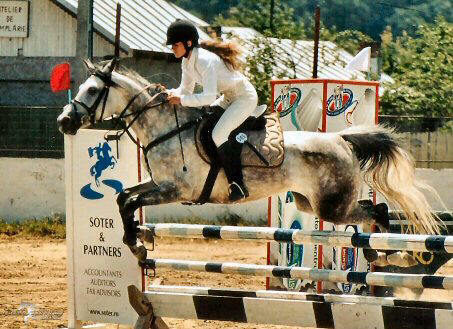 October 2001: Amateur Showjumping event at Hipocan Corbeanca. First class was a novice 60 cm ridden by part owner Cora, which finished the class with 4 faults penalty only because they got lost in the track and made a vault. Second class was also the Amateur final of 2001, with 90cm -100cm jumps, ridden by Bobby Negrei. This class did not go all that well, due to influenzae, and abandoned the class after a stop in the combination. 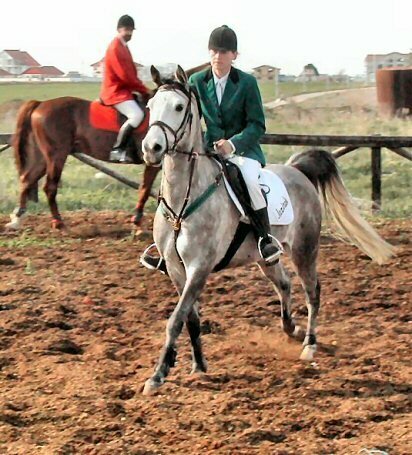 April 2002: The Spring Cup held at Hipocan Corbeanca, first entered in the amateur novice class, 60 cm with Magda Lungan who made a clear round performance in her first competition ever. The second class was 80 cm, also with 0 pts penalty and placed 7. 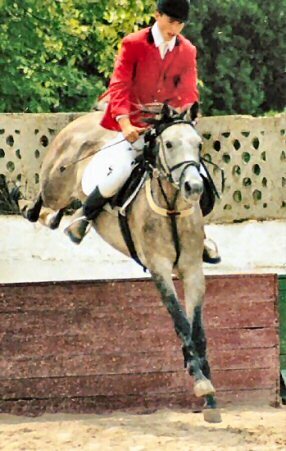 June 2002: Amateur Event at Hipocan Corbeanca, entered in the novice 60cm class with Magda Lungan and finished the 90cm jumpoff with 4 pts penalty, placed 5th. September 2002: Tried out the 3-day event course at Asil Horse Snagov, first time on the sandbanks and jumping trenches, did fine, although not entered in the amateur event as earlier planned, due to lack of rider. May 2003: Young Horse and Amateur Event held at Steaua Bucharest. Entered in 60cm novice with Magda Lungan as warmup, where they made a clear round and placed 1st. Also entered in the 80-90cm Amateur class where they won after finishing a fast and penalty free jumpoff. June 2003: Missed the jumpoff at the Bucharest Cup 2003 held at Hipocan Corbeanca by knocking down the rail of the last obstacle in the 90-100cm class, and 4 points penalty for laying a vault after forgetting the track in the 80cm class. This is how far we have come right now.